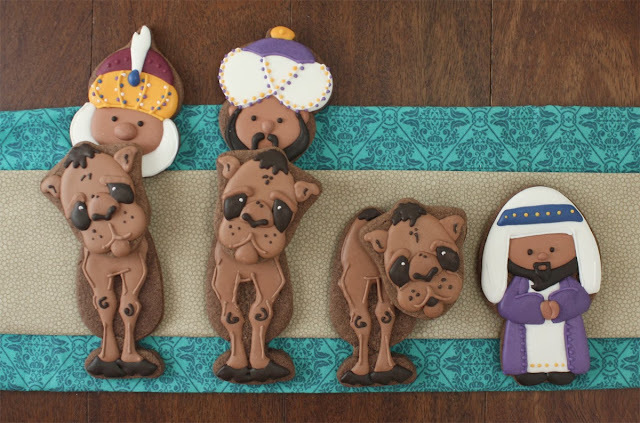 Last week I showed you how to make Wise Men cookies and today I have the camels! I've done my share of silly cookies but these camel cookies are easily the silliest ones I have ever made. If you want to add a little humor to a Christmas platter try just making the faces or you can get really crazy and make the bodies too. 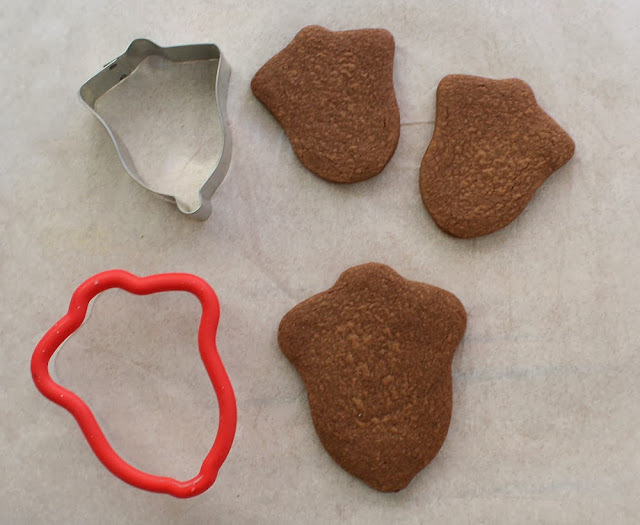 I cut the camel faces with 2 sizes of bell cookie cutters flipped upside down. The bell was the closest shape I could come up with and it works pretty well because of the way the shape narrows for the face and widens for the ears. Since bell cutters come in so many different sizes and shapes you have a lot of options. If your bell cutters have a large clapper or handle you can trim that away when you cut your cookies. This first step is just for locking in the shape of the head. Using tan piping icing pipe a roundish shape . Mark the mid-line of the circle and then pipe the large cheeks down around and back to the mid-line. Let the face dry for a few minutes and then add the ears and the lip. Then let the cookies dry for several hours so you can work on this base. 4. When the bases have dried a while add the nose. 5. Let the nose dry for a few minutes and add the eyes. You can add the other details now too if you like. 6. Let the eyes dry a bit and then add the eyelids and the white "shines" on the eyes. 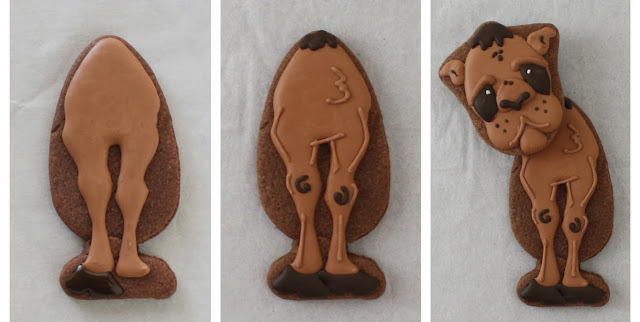 I also thought it would be fun to make a body for the camel on a separate cookie so the heads could be place and tilted in silly ways on top. The bodies were cut from my favorite carrot cutter. Pipe an egg-ish shape for the body and add the legs The way the lines alternate jutting out and coming in gives him his knobby knees. Fill in the body before the outline dries. 4. When the body has dried for several hours add one hoof. 5. Let the hoof dry a few minutes and then add the other to create dimension between them. Finish off the body with a few detail lines. 6. Stack the smaller camel heads onto the bodies in silly ways. 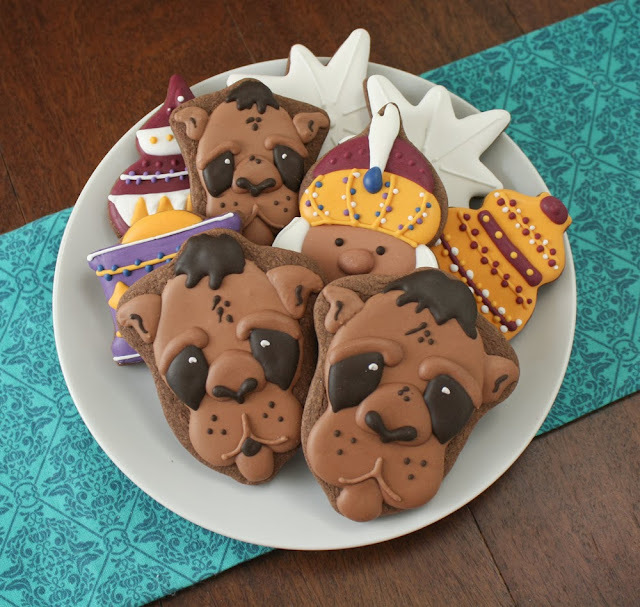 If you like you can "glue" the head to the body with stiff royal icing and then support the head on a separate cookie until the icing has fully dried. Hehe, how much fun are all these little guys! Be sure to check out my tutorial on how to make the Wise Men too. I hope you are having as much fun as I am getting ready for Christmas! Omg these are PRECIOUS! !! LOL! love the heads on those wobbly bodies! would never have thought about making camels at Christmas. These are so good. How do u make ur icing? Thank you for the share. It is a wonderful idea. Love the whole set! J'adore tout ce que vous faites !!! c'est vraiment magnifique !!!!!! 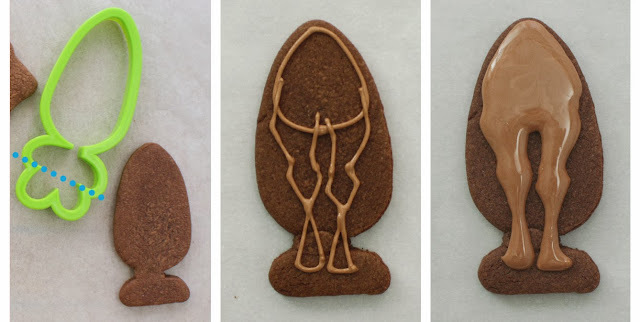 Oh Sarah, I'm lost for words on how creatively adorable these are! You're awesome! This is AWESOME! Thank you for this great post and sharing it with us. I've been looking online for something like for almost two hours! I'm going to share this on my site.